UK spot prices were supported this morning by further upward temperature revisions for next week. Wind production is expected to be maintained at current levels tomorrow which may restrict gains on prompt contracts but not completely inhibit further increases next week. NBP spot prices remained steady yesterday on the back of healthy supply levels. Fundamentals also remain steady today with no significant movement expected across the curve. The over-supplied UK system could weigh on NBP prices today. UK gas prices shed value yesterday as increased wind generation helped the system stay long throughout the session. Demand from gas fuelled power stations fell to 32mcm, down 7mcm from the start of the week. The continued appreciation of the Pound relative to the Euro helped far out contracts fall. UK Day-Ahead power prices fell significantly yesterday as low demand forecasts were coupled with increased solar and wind generation. Wind output is expected to be over 6GW today, whilst solar generation is anticipated to reach 3.4GW. As with the gas curve, the appreciation of the Pound against the Euro weighed on power contracts as the cost of imports of gas and power from the continent is reduced. UK Gas contracts opened at a loss across the curve this morning, with Day-Ahead falling 0.40ppt. UK gas demand is down this morning due to increased wind generation lifting the pressure off gas fuelled power stations. As a result, the UK system is oversupplied this morning which will likely weigh on the curve. Forecasts of reduced wind generation for next week are expected to limit losses though. 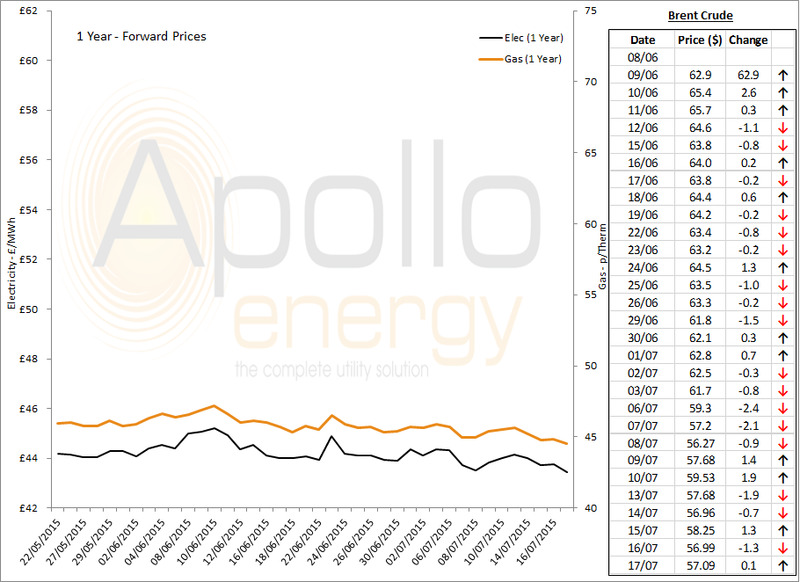 The UK power curve followed its gas counterpart this morning, with losses being seen across the majority of the curve. Day-Ahead however rebounded £2.50/MWh this morning, following its sharp decline during yesterday's session, as temperatures are revised upwards for the beginning of August. Market close data has revealed that the 1-year forward price for both commercial gas and commercial electricity decreased slightly - closing at 44.55ppt and £43.45/MWh, respectively. This can be seen in the graph below. Brent Crude maintained a steady price yesterday as the market remains bearish due to concerns regarding oversupply following the Iranian deal. Britain's Buzzard oilfield in the North Sea was closed yesterday after problems on Wednesday night. Outlook is expected to remain stable to bearish today.